Known for their exact design, fine quality and durability, our Semi Automatic Ropp Capping Machine is quite popular among the customers. As a leading Manufacturer, Exporter & Supplier, we keep our quality in synchronization with our reputation. It is procured from the reliable vendors who put quality on the top of their priority list. We make the machine available for pocket friendly rates. You may also get it delivered by our valued customers. A very demanding machine in fast production industries. Machine consists of a frame structure made from angle structure, a motorized capping head arrangement, and a motor operated bottle lifting assembly. The machine comes complete with capping arrangements and control switch. Filled bottle is fed to the machine on the small platform where a bottle locator is given. The machine is attached with a motorized cam bottle lifter for lifting the bottle for sealing it. There is a capping motor attached at the top side of machine with speed reduction pulleys. The driven shaft carries the rotating capping head. The capping head for ROPP capping is having 2 rollers at opposite sides at different heights with one fix position and other spring loaded. There is a control switch provided with the machine to operate the unit. The height of head as per different height requirements are possible by rotating the hand operated wheel at the top side. The rotating parts are covered by a sheet metal cover. 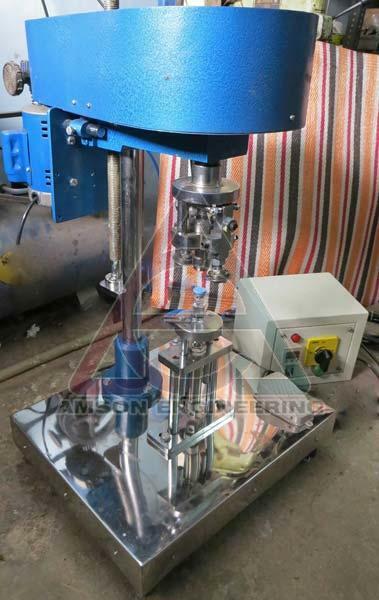 When a filled and cap placed bottle is placed below the head on platform, the only operation done is to start the machine, the lifter motor and wait till the capping is done. The operator has to place and remove the bottles as capping is done. When the perfect capping height is set, the motor can be started so that capping operation is done. The adjustments of rollers are possible to get perfection. From this machine, tightening of caps to the required strength occurs. Capping station can either screw capping / VIAL capping or ROPP capping are possible according to the requirement of customer. After tightening, the capped bottles are removed by hand for final inspection and packing. Main Capping Motor : 1/4 HP 1440RPM, 1 Phase, 50Hz. Number of Heads : 1 Nos. Bottle Lifting Motor : ¼ HP geared. 220 VAC Single Phase. Eccentric cam and bearing for lifter assembly. Electricity required : 1 Phase, 220VAC,50Hz, 1 Kwh. Operating switches for both motors provided. Output : 20 containers per Minute maximum. Adjustable height as per bottle height variations. Labour required : 1 semi-skilled operator.